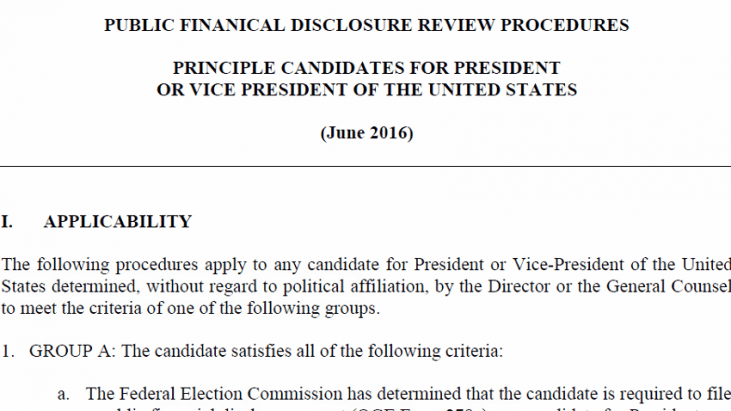 Candidates for President or Vice President must file an annual Office of Government Ethics (OGE) Public Financial Disclosure Report with the FEC within 30 days after becoming a candidate, or by May 15 of that calendar year, whichever is later, but at least 30 days before the election. After a candidate has filed his or her initial public financial disclosure report, the candidate must file an annual OGE Public Financial Disclosure Report with the FEC on or before May 15th each successive year in which the individual continues to be a candidate. A presidential or vice-presidential candidate may request an extension of time up to 45 days for “good cause shown.” The request must be in writing, and must explain the “good cause.”A candidate may request a second 45-day extension. Below, you will find the document released to me under the FOIA. You will note the fun spelling errors that currently plague the document.